Luxros Retinol Cream is great for keeping the skin hydrated and plump, but not great if you’re looking to help deeper wrinkles on the skin. 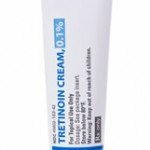 This retinol cream has a thick and luxurious feeling to it, and as you apply it to the skin, it doesn’t leave the skin feeling suffocated. The applicator on this product is super annoying because it doesn’t work well and only lets out a little bit of product at a time. The product feels really nice on the skin, and after it dries, it leaves the skin feeling hydrated but doesn’t leave any residue on the skin. After using this cream for a short period of time, my skin felt soft and very hydrated, but I didn’t notice any immediate differences to my skin. I noticed after using this cream for a longer period of time that my skin continued to feel really soft and it improved the texture of my skin. It also continued to keep my skin super hydrated and over time it started to plump up my skin, which helped the fine lines a bit. 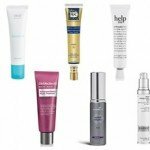 But, I will say that although it plumped my skin, it didn’t help my wrinkles as much as I wanted. I liked this cream more for the moisturizing benefits than the anti-aging benefits. Overall, Luxros Retinol Cream was good at moisturizing my skin but not great at helping reduce my fine lines and wrinkles. Luxros Retinol Cream has a rich and creamy texture when it’s first applied to the skin. As you apply the product all over your face, it has a nice rich consistency without feeling too thick on the skin. Luxros Retinol Cream has a really annoying applicator; it’s a pump but because the bottle is so small, it pumps out tiny bits at a time and the pump applicator only works about half the time. Since this is a thicker cream, you will need a few pumps to cover your face and additional pumps to cover your neck and chest. Luxros Retinol Cream dries fairly quickly… in about 30 seconds. Once the product is dry, it leaves your face feeling moisturized. I love the smell of Luxros Retinol Cream; it smells like spring time flowers but isn’t too strong or overpowering. After using Luxros Retinol Cream for a short amount of time, I noticed my skin was feeling very hydrated and soft, although I didn’t notice any major differences in the fine lines and wrinkles on my face. Over a longer period of time, Luxros Retinol Cream continued to keep my skin feeling hydrated and soft, and I noticed that it was plumping my skin a bit. Although I noticed minor differences in my fine lines and wrinkles, I wasn’t very impressed. I was hoping to notice a much bigger difference in the fine lines and wrinkles on my face and neck. Luxros Retinol Cream is packed full of great, hydrating ingredients so it’s no surprise that it kept my skin so hydrated. A few of those ingredients are vitamin E, aloe, and shea butter. Vitamin E is an ingredient that helps fight off free radicals from the skin. Free radicals are a major cause for wrinkles so vitamin E is essential in helping with anti-aging to the skin. 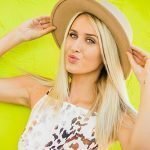 Aloe is a healing ingredient that takes damaged skin and helps repair and restore the skin as well as provides a lot of moisture and hydration. Shea butter is great for instantly restoring moisture to the skin as well as helping to plump and fill in fine lines and wrinkles. These three ingredients are really great for keeping the skin hydrated and helping with antiaging of the skin. The cost of Luxros Retinol Cream is $24.99 for 1 oz of product. This is a bit above an average price for a retinol cream. Unfortunately, there is no money back guarantee for Luxros Retinol Cream. 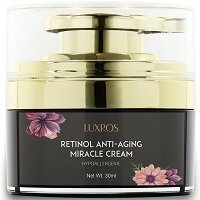 To buy Luxros Retinol Cream, click here. Ingredients Shea butter is great for keeping skin plump and moisturized.